It's not a sad story, just a long and complicated journey involving a happy little guy who braved it all. Speedy's Story begins at 5 weeks old. He was sold by a backyard breeder (BYB) to his first owner. By 6 weeks old he was sold again on Facebook to yet another home, and by 7 weeks old (possibly younger) he was surrendered to a vet clinic. Thankfully they took him in so he could go to a rescue. It's not a fantastic start but at least his owners had the sense to know that a puppy is a huge commitment and a vet bill waiting to happen. After the glow of a new puppy arriving, reality set in. He was going to need microchipping, 3 booster vaccinations, flea treatment, heartworm preventative, desexing if he's lucky, wormer, shampoos and brushes, leads and collars, toys and treats, food, somewhere to sleep, time, patience, housetraining and lots of attention. So that is the beginning. It could only go upwards from there. Cut to Day 1 as an SSR dog. This boy was cute! He's still a cutie-pie now but as a baby he was pure sweetness. Smart, playful and cuddly. We let him grow and socialise, especially making sure he had lots of positive contact with his housemates. When he discovered cats are just like furry hot water bottles who play with you too, he became a bit of a fan. 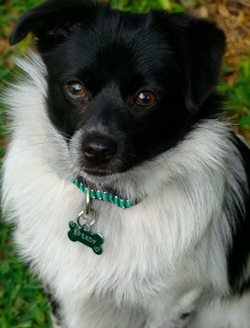 Once he was old enough, off he went for desexing and he was listed for adoption with his best gal Apple. Such a happy pair who played endlessly, we hoped they could be adopted together. Sadly it wasn't to be. I started to noticed that sometimes he had a strange skip. Sort of like the 'skip' dogs with a slipping patella (kneebone) can exhibit at times. 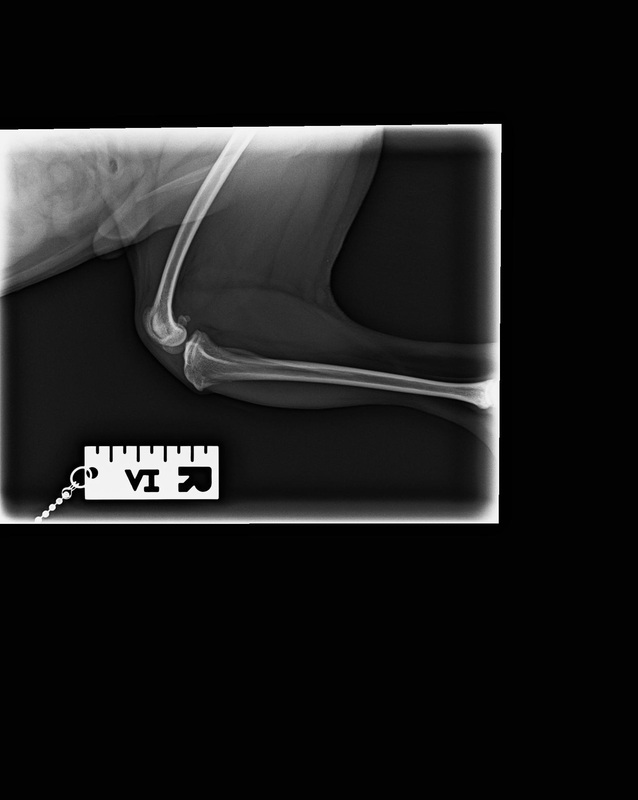 Low grade slipping patellas can be part and parcel of owning a small breed and although in 99% of cases it's completely harmless it's still the kind of thing to keep an eye on when you're planning to rehome a doggy. Just as I became suspicious that his legs were not looking like they should, he suddenly squealed in pain, holding his little leg out....that was it. Straight to the vet. My first thought was that it was the dreaded hip dysplasia. This is when the wheels fell off his smooth progression from foster puppy to adopted doggy. What he had was two slipped patella! But worse still was that his legs appeared to be growing abnormally. I'll say this now : because it seems like a sad story and it kind of is in a way. But Speedy is a star. He was and is, an excitable, happy, loving and clever soul. He trusts. He loves. He cuddles. When Speedy is unsure, he asks for reassurance. And when he's happy, you can't stop that tail! You can read every thought and every emotion on his little face. And nobody gives better snuggles than Speedy. With a heavy heart, choices needed to be made. I realised Speedy was going to be a long term rehabilitation. Not what I'd hoped for when he should have been bouncing around in his new home. 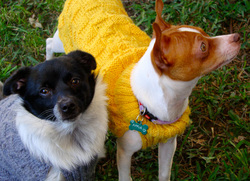 Instead, his bestie Apple was listed for adoption on her own. Two reasons: he was no longer allowed to play with her in case he hurt himself, secondly she needed to start her life sooo much. We waved goodbye to Apple and she now has her very own home. She sends photos of her and her new friend Gizmo. Speedy missed her but adjusted in time. I could tell he missed her and there was nothing I could do. He sought comfort in the other dogs and they were happy to provide it. Waited for him to stop growing. Not letting him run around like a normal dog his age. No trips to the park in case he got bowled over. No proper walkies in case his knees slipped or his leg twisted. Don't get me wrong, he was still spoilt, happy and loved. He was still allowed to use the steps up to the sofa and sprawl out with his mates. He loves a sniff around the garden and playing a strange sitting & boxing game with the cat. It might be hard to understand but as a rescuer you want so much for their future. You're so full of hope. I wanted him to have a full life and his own family. Below you will see the final adult development of his bones. The scan, reviewed by his soon-to-be surgeon showed a rare and serious malformation in both legs. One worse than the other. 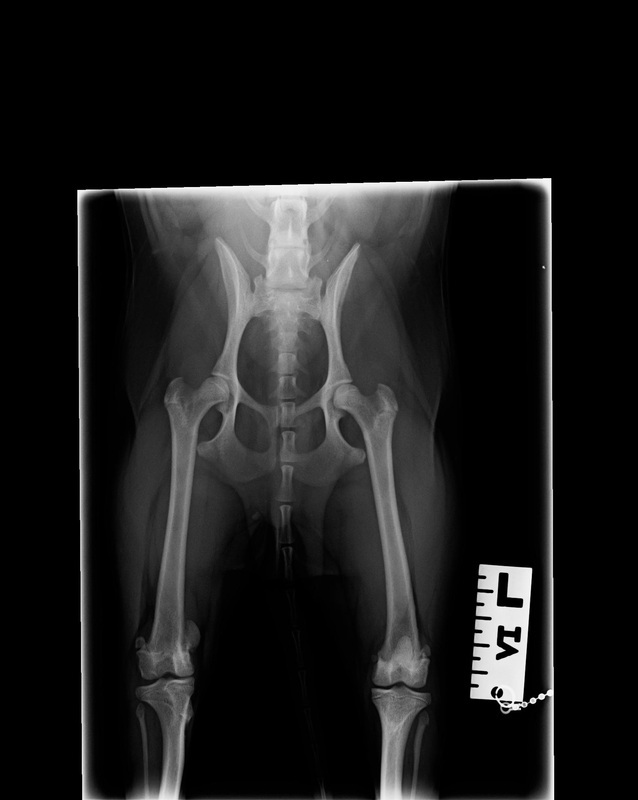 You may even be able to spot his kneecaps (patellas) sitting exactly where they shouldn't be! His long bones were bent and both knees had been forced completely out of place and were useless. If ignored, he would have developed early arthritis and lived a life teetering on wonky legs. Risking further painful episodes. 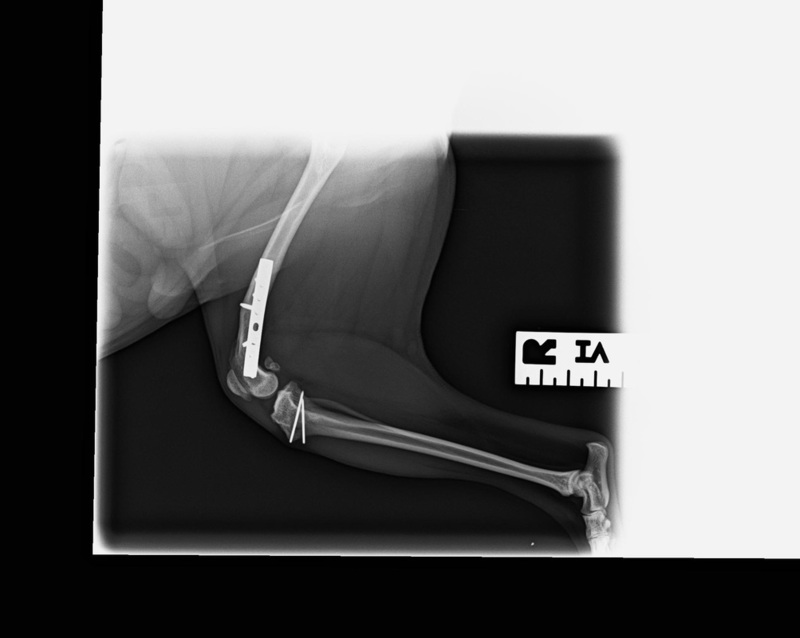 Finally, months later and with a really stable and well functioning leg that looks fantastic, we booked in for Surgery 2. 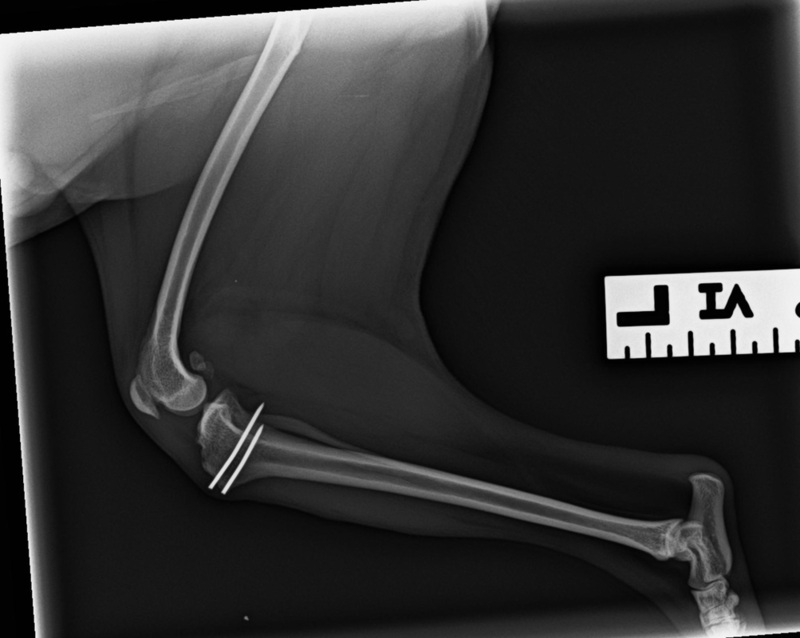 This time just the one bone was reset and his floating knee was placed securely in the right spot. And today (Dec 2014) , he's still in recovery but doing well. He's allowed a little extra time out of his pen and has really bounced back quite fast. It's actually hard to make him sit still. It's been a painstaking process but the light is at the end of the tunnel. The day Speedy gets to let loose with all his energy and enthusiasm ... look out world! February 2015 Job well done! Ta-Daa!! We have liftoff. Thank you so much for all your help and support, it's taken what seems like forever but Speedy is officially done with surgery and recovery. 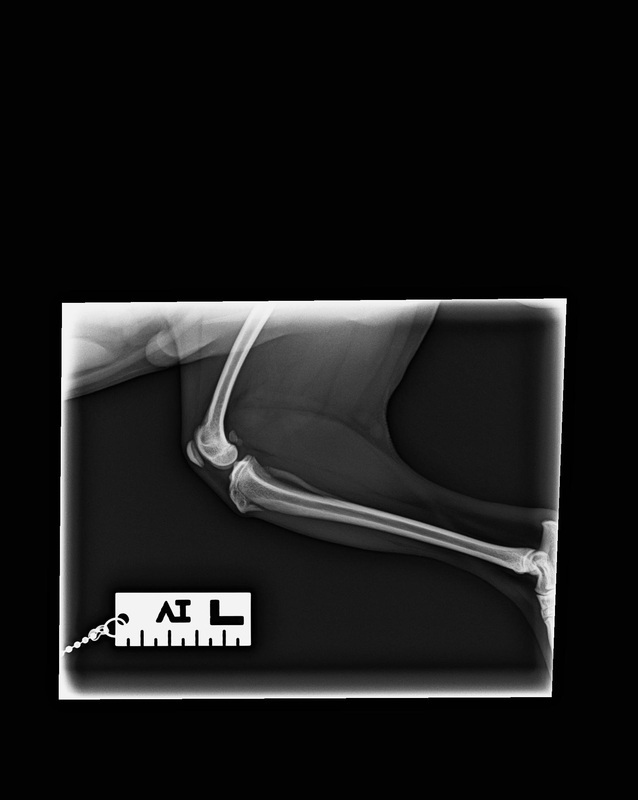 Have a look at Speedy's final x-rays. All bones and implants have healed and are where they should be. Even those cheeky kneebones that were off doing their own thing have been secured in one spot. And best of all...Speedy has the tick of approval. Yay Speedy! If you've found this page it's because we're getting the little guy 'out there' so more people know his story and maybe he will capture the heart of a special person. He has a LOT of catching up to do which I will try to get a head start on. Life kind of stalled for him. Not in every single way but enough to mean that his new person will need to be kind, quiet and patient. Some things will be a challenge for Speedy. He's had such a sheltered life, I can only imagine how huge it's going to be for him to leave home like a little bird flying the nest. Thank you for reading his story, I hope you adore him as much as SSR does. When he finds that perfect home I'm going to miss him and maybe even have a little cry but it's for the best. No matter how much I love him, he deserves a wonderful home where he can be doted on, without foster dogs coming and going. He is still a young doggy at just 2 years old and has so many happy years ahead of him. Kind, gentle and enthusiastic about life. Speedy is a very special boy. He's been listed on the Pets For Adoption Page. Well the big day finally arrived. Speedy has left us and started his adoption trial period. It's a time when Speedy and his new family get to know each other. The day Sue and Rod's form arrived in the inbox was very exciting, but also a little sad. It was time to let go, and understand that this is the best thing for Speedy. And after hearing that Speedy was being a good boy and settling happily with his new sister Minnie it was a day for celebration. Well done my boy, we're all very proud of you.